The Coaldale Copperheads are one game away from being swept by the Airdrie Thunder in HJHL championship series action. The best of five affair started with game one in Airdrie Friday night with the Copperheads falling 3-1 to the Thunder. An early goal in the first period for Airdrie stood as the only marker till Ty Abbott scored a power play goal early in the second period. The Thunder replied in the next shift to make it 2-1 then again later in the second to go up 3-1. The third period was scoreless despite the Copperheads having multiple power play opportunities. Shots on goal were 49-25 in favor of the Thunder. Game two at the Snakepit was a much better effort from the Snakes, but still came out with a 6-4 loss. Shots were 27-28 for the Thunder, which was close in scoring till mid way through the third period. 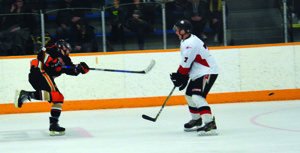 Scoring for Coaldale was Jayden Smith, Clayton Nevil, Jared Bainbridge and Jason Creighton. The Copperheads face getting swept in game three Tuesday night in Airdire. If they pull out the win, game four is slated for the Snake Pit Saturday night the 30th at 7:30 pm. If needed game five will be held in Airdire Sunday at 5:00 pm. Both division winners qualify for Provincials the first weekend of April in Wetaskiwin.